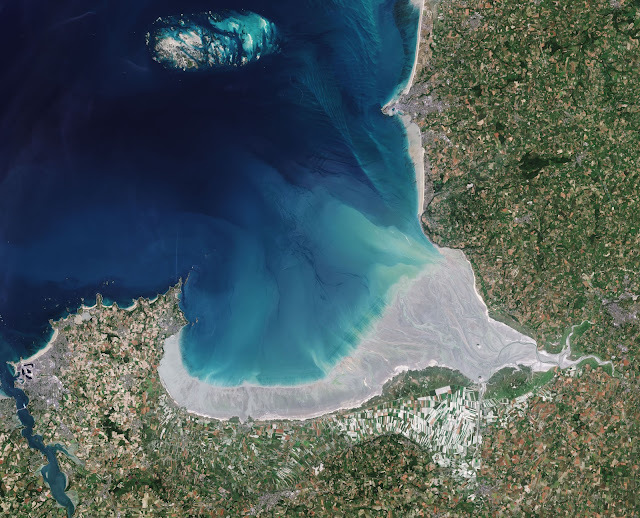 The Copernicus Sentinel-2 mission takes us over the Bay of Mont Saint-Michel in northern France. Lying between Brittany to the west and Normandy to the east, this remarkable bay, which is listed as a UNESCO world heritage site, sees some of the biggest tides in continental Europe. There can be up to 15 meter difference between low and high water. When spring tides peak, the sea recedes about 15 km from the coast and when it returns it does so very quickly, making it a dangerous place to be. Sentinel-2 captured this image when the tide was out so that the vast area of sand dunes is exposed cut by meandering channels of shallow water. Three rivers empty into the bay: the Couesnon, the Sée and the Sélune. This image, which was captured on June 21, 2017, is also featured on the "Earth from Space" video program.